The Moorings, a leading yacht charter company, is now offering Power Yacht Charters aboard the Moorings 393 Powercat in the Pacific Northwest. 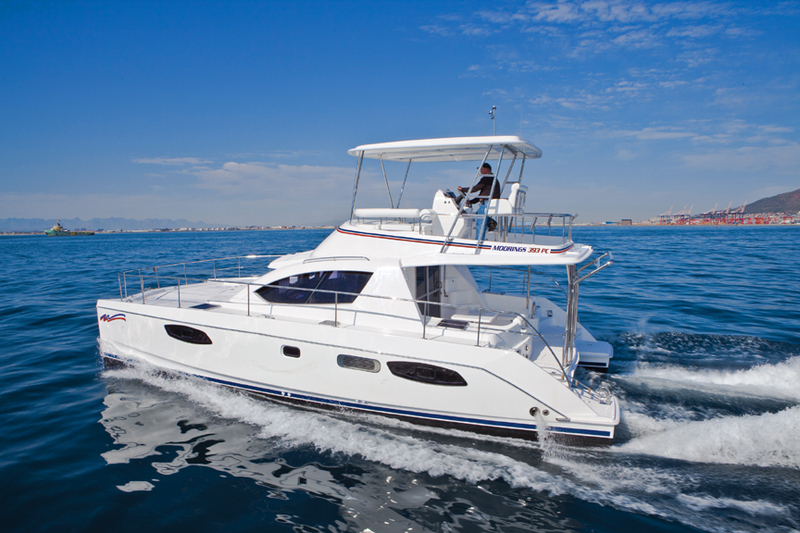 The Moorings, a leading yacht charter company, is now offering Power Yacht Charters aboard the Moorings 393 Powercat in the Pacific Northwest with their Preferred Partner, Anacortes Yacht Charters. The expansive cruising range offered by this power catamaran will allow charter guests to enjoy the natural splendor and lively cosmopolitan atmosphere offered by a two-country itinerary throughout U.S. and Canadian waters. In the Pacific Northwest, there is something for everyone. The historic town of Anacortes – a key destination for power yacht charters – offers the ability to cruise through the protected waters of Puget Sound while experiencing charming towns steeped in history, quiet fishing villages, unique shops, and delectable farm fresh cuisine. Other itinerary options will lead charterers through more than 2,000 islands of the U.S. San Juan Islands and the Canadian Gulf Islands. These waters are home to mountainous evergreen peaks, secret fjords, protected anchorages, waterfalls and all types of wildlife. Those who enjoy sightseeing will want to experience Victoria, the capital city of British Columbia located on Vancouver Island, which is well-known for its cobblestone streets, jazz scene and magnificent Fairmont Empress Hotel. While just across the Strait of Georgia, the cosmopolitan city of Vancouver is home to a unique mix of cultures, art galleries, parks, distinct neighborhoods and fantastic restaurants all surrounded by snow-capped mountains and crystal clear water. The Moorings 393 Powercat designed by multihull architects Morelli & Melvin and built by Robertson & Caine, features a cutting edge design with 3 deck levels, large functional living spaces, and amenities such as air conditioning, flat-screen TV/DVD player, sound system with MP3 connection, and upgraded electronics, including color chart plotter. The 39-foot power catamaran has a roomy saloon and galley plus 3 cabins and 2 heads, with a luxurious suite in the starboard hull. On the fly bridge, a centrally positioned helm station offers excellent visibility on all corners of the yacht for ease of maneuvering. Powered by two 110hp Yanmar diesel engines, she delivers excellent fuel efficiency, with solar panels on the hard top to provide additional power supply. For information about The Moorings charter vacations, visit www.moorings.com or call 1-800-535-7289. 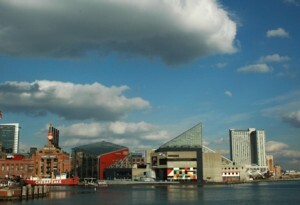 Baltimore’s Inner Harbor. © 2012 Karen Rubin/news-photos-features.com. The Moorings has just opened its newest yacht charter destination in Annapolis, Maryland for bareboat sailing, power and skippered charters on the Chesapeake Bay. The fleet includes a range of monohulls built by Beneteau and catamarans from Robertson & Caine. Charming, historic and idyllic, boating in the Chesapeake Bay is the perfect way to discover the scenic shores of Maryland. A world-renowned boating destination, the Chesapeake Bay is the largest estuary in the United States, spanning approximately 200 miles long from the Susquehanna River in the North to the Atlantic Ocean in the South. This area offers fantastic cruising conditions with consistent southwesterly winds averaging from 5-20 knots, as well as a balanced mix of sights ashore including the Bay’s more modernized, bustling east coast cities like Baltimore and the west coast’s quaint, old-fashioned fishing and crabbing towns with wonderful maritime heritage. Annapolis, as well as the Bay area, is widely recognized as “the place” for fresh seafood, and feasting on their world famous steamed crabs is a must-do after a stroll through the historic colonial streets of Downtown Annapolis. The Moorings’ fleet is a mix of monohulls and catamarans for sailing charters, as well as the newest power catamaran – The Moorings 393PC. Monohulls available for charter include the Moorings 40.3 (3-cabin/2-head) and Moorings 42CC (4-cabin/2-head), which features a center cockpit with offset helm position that opens up the cockpit space, allowing for improved sailability and an aft deck. The luxurious new Moorings 3900 sailing catamaran and Moorings 393 Powercat will also join the Annapolis fleet, both featuring 3-cabins and 2-heads, including a spacious master suite in the starboard hull, generator and air-conditioning. Powell added, “The Annapolis Landing Marina was our first choice because of its excellent proximity to many itinerary highlights and because the property presented the most inviting venue for The Moorings customers with a wonderful host of yacht club-style amenities, including a pool, restaurant and picnic area. Charters on the Chesapeake Bay begin May 15, 2012 from The Moorings new home at the Annapolis Landing Marina; conveniently located a short drive away from Downtown Annapolis and the Chesapeake Bay waterway, as well as 45-minutes from the excellent domestic and international connections of Baltimore/Washington International Airport (BWI). For more information about The Moorings Annapolis destination, or charter vacations, visit www.moorings.com or call 1-800-535-7289.